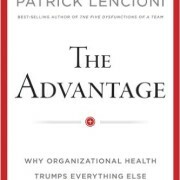 I heard Patrick Lencioni speak at the Willow Creek Global Leadership Summit and that prompted me to pick up his latest book, The Advantage: Why Organizational Health Trumps Everything Else in Business. I’ve been a fan of Lencioni’s work for a while. In fact, one of his previous books, The Five Dysfunctions of a Team loosely inspired my blog posts in 2009 chronicling the top four most common corporate delusions, and then the fifth and sixth most common corporate delusions. Note: Most of the ideas in this post are Lencioni’s, however, in some places I’ve extended concepts he started with my own thoughts or thoughts from other books. I’ve made every effort to delineate what came from The Advantage and what came from elsewhere. One of the prerequisites for a good organization is for it to have a good leadership team – and that isn’t to say that each of the members must be good at their roles – that is an assumption. Having a good leadership team is to say that they have to be in sync with each other – willing to accept each other as whole human beings and also willing to challenge each other. This is where I believe the challenge lies. The level of personal strength of character that it takes for a leadership team to be both open and vulnerable to one another is strikingly uncommon in my experience. Lencioni lays out a set of five behaviors that he believes will build a cohesive leadership team – which I agree that if these things are done, you’ll get a cohesive leadership team. I’m just not sure that there’s not still a point of “and then the magic happens” where the caterpillar is transformed into the butterfly. In other words, it’s easy to say and hard to do. In fact one of the exercises that Lencioni discusses – an exercise where the entire team talks about one of the best things about a person – as it relates to the team – and then shares one of the most challenging things about every other staff member. The hope is that everyone realizes they are imbued with strengths and weaknesses. Lencioni discusses how this exercise must begin with the leader and their willingness to accept their strengths and weaknesses – so that the rest of the team will understand how to respond. So fundamentally I’m in agreement about the approach. Building trust – not through some fluffy rope exercise but real trust – is critical to a leadership team. Much of my consulting time is creating pockets of trust in an otherwise distrusting organizations. Where I believe that Lencioni and I may differ is that I don’t believe that a two day workshop can build trust between managers. I believe that a two-day offsite can sow the seeds of trust in an organization, but I’m not convinced that anything short of a long-term coaching engagement can really transform a leadership team and help them to realize their deep need to trust each other and the great lengths that they go to in order to avoid trust. In short, my experience has been that most folks aren’t comfortable with themselves enough to really trust others. Because they don’t trust themselves how could they trust someone else? This may be a rather dim view of the state of leadership in organizations, however, I believe it’s born out in news stories every day. Some people are conflict avoidant. Other folks are instigators – always looking for a conflict. Always looking for a fight. Some folks, like myself, are conflict apathetic. That is to say that we’re not really deeply troubled by conflict. As a truth, no one really likes conflict not even the conflict apathetic. It’s always a bit unsettling, however, sometimes conflict is necessary. Said differently as the lyrics from an Alanis Morissette song, the only way out is through. In my experience most organizations that conflict is avoided like the plague. I see people nod their heads in meetings only to do nothing later – or occasionally sabotage the actual initiative. One of the techniques that I’ve seen good project managers do – and is called out in The Advantage is actively asking each person in the meeting for their agreement with the decision. Another technique mentioned to get everyone talking is that the assumption will be disagreement – rather than agreement – if someone stays silent. One of the challenges I often see in business conflicts is people who hold onto a position well past the point that the position appears silly to everyone in the room –including the person who is supporting it. The result is frustration sets in because someone isn’t able to accept that their position wasn’t the “right” position. Achieving commitment is predicated on the need for professionals to abandon their positions when they no longer make sense. Achieving commitment is built upon resolving conflict but extends this to reaching a consensus about the right course of action – that everyone is agreeing to take. Few organizations that I’ve worked with really embrace accountability. In fact most of them have a form of commitment cancer that’s insidious. I first mentioned commitment cancer in a post about running users groups back in 2010. Commitment cancer is the failure to hold other folks accountable for their commitments. I see it everywhere. I “grew up” in publishing. With author credit on 22 books and editor credit on numerous others, I got to know how technical publishing works. However, in some ways, it doesn’t really work. It just appears to work. The schedule for publishing a book is notoriously a matter of fiction. Every acquisitions editor knows that whatever schedule that you start with won’t be the one your end with. It’s routine for authors to be weeks, months, and sometimes years late on when they say they’re going to be done. Everyone in the industry simply expects this to be a truth and therefore there’s only the most trivial level of wrist slapping when an author is late with a chapter – or the whole book. There are a lot of down-stream impacts with editors, printers, etc., but this is just accepted as a cost of doing business. However, a healthy organization is one where commitments that are made are commitments that are honored. I should say that they don’t have to be met every time – but they should be renegotiated when they’re not going to be met. That’s great in theory, however, most business people don’t operate with this high a level of personal integrity. They instead hide when they miss a commitment. They don’t really hold others accountable when they miss a commitment either. Everyone has entered into a tacit agreement that if you don’t point out when I miss a commitment, I won’t call you out when you miss yours. The problem with this is that it complicates the process of getting anything done because you never know whether something will happen – or not. Holding everyone accountable, as Lencioni points out, is something best handled directly by peers. When a manager has to force accountability there’s an internal resentment that builds based on the confusion about who “ratted them out.” When peers are free to professionally challenge each other and hold each other accountable the leader doesn’t need to step in and the team will function more effectively. Ironically to get to this state the leader often has to start by holding people accountable so that everyone knows what to expect. Over the long term, a team that isn’t producing results isn’t a good team. I understand that there may be market factors, there may have been insufficient budget, there may be force majeure – but over the long term if a team isn’t producing – it’s not a good team. Some would argue that good teams can be put in bad situations. I’d agree – but then again good teams will get themselves out of a bad situation eventually. Ultimately the effectiveness of the organization will be based on results – and so too should everyone inside the organization. In a sense, the focus on results is the natural outcome of accountability. Ultimately someone has to be or become accountable for the results just as the CEO is accountable for the overall performance of the organization. Most folks see the key change that lead to the industrial revolution was the development of the steam engine – however, I see the situation a bit differently. I see a situation where the standardization of parts. Suddenly we started to have consistent bolts, nuts, etc., which could be used relatively interchangeably. This may seem like a trivial, insignificant thing and in some ways it was. However, in other ways the clarity of having a set of standards allowed people to work together who didn’t know each other – and that lubricated the economy in ways that couldn’t be expected before. Having a common standard or a way to communicate precisely between a set of people has a dramatic impact on the amount that can be done. We’ve all had situations where we have had misunderstandings with someone else. Where the word that you were using meant something to you – and something different to someone else. It was probably comical when you discovered the source of the miscommunication. However, that didn’t save you from the time it took to find the miscommunication. In many of the leadership and change books that I’ve read such as: Switch, Good to Great, Leading Change, and The Heart of Change there’s a common thread of resistance to change. And a common message that sometimes things which on the surface appear to be resistance to change aren’t really resistance to change as much as it’s a lack of understanding about the change and when folks aren’t sure what to do by and large they simply stop and wait for clarity. However, when clarity doesn’t come it’s rare that they’ll seek out clarity or spontaneously start taking actions. Even a small amount of fog in an otherwise clear message can add up to a big change. For a moment imagine a point with 360 lines radiating from the point in one degree increments. When the lines are very close to the point, the amount of separation is minute. It’s quite difficult to determine one line from another, however, as the lines project out further a great deal of space will exist between two lines even if they’re only one degree different. This is how clarity works. Even a small degree of lack of clarity can lead in an infinitesimally small error – until that error is projected out through the weeks, months, and years. Ferreting out where there is a lack of clarity can be a daunting challenge. It involves not only the obvious work to address language differences and differences of interpretation but also the conversion of the generic agreement to a specific agreement. The old saying that the “devil is in the details” is true here as it takes time to think through even a subset of the different ways that an agreement will impact various departments – and to verify that those impacts are truly intended. One technique that Lencioni uses is the creation of a playbook which answers six questions. When a football team takes the field they’ve got something that most organizations don’t have and that is a playbook. They know what the plays are that they’ll run and how to identify them. While it’s not possible to script out every part of every play on a football field any more than it is possible to script every part of a business, the playbook forms a common language and a standard set of operating procedures for how the team expects to operate before improvisation needs to happen. In the book Heroic Leadership there was the concept of “our way of proceeding” – a set of guidelines and a worldview shared by the Jesuit team. This was described as a compass and not a checklist. That’s exactly what a playbook should be inside of the context of a business. It should describe the operating principles and approaches without attempting to be an exhaustive catalog for every decision. Core – These are the unchanging values upon which the organization was founded. They’re essentially immutable. Permission-to-play – These are the values that they believe the market requires for any organization to participate. These are the values that every organization says that they have. In consulting it’s generally hiring only the best people, etc. Accidental – These are values that just happen to be a part of the organization and may – or may not – be helping the organization. There is guidance for the other questions as well – but ultimately the goal is to create a clear vision of where everyone is going and what they’re doing. How many times should you tell your employees about your mission, values, and current goals? One more time than you’ve already told them. While leaders have had the benefit of working through and refining the vision the employees of the organization have not. They’re experiencing it like they would experience advertising. And in advertising you have to deliver a message seven or more times for folks to recognize it. Guerilla Marketing quotes Thomas Smith from 1885 which speaks of needing to see something twenty times before taking action. Whether it’s seven, twenty, or two thousand – it’s more than the once that leaders want to communicate it. In an organization part of the need for repetition is simply to demonstrate commitment. Employees hear so many initiatives, goals, decisions, etc., that they are challenged to sort out the noise from the truly important pieces. Leaders on the other hand, driven by efficiency, hate the idea of having to redeliver the same message over-and-over again. Delivering the same message over-and-over again frustrates leaders who are always looking for a challenge. However, as Diffusion of Innovations pointed out, knowledge isn’t the same thing as changing someone’s attitudes, much less practices. Repetition is a part of changing behaviors – because the learning becomes more ingrained into the person. Repetition alone won’t drive a change in practices for everyone, however, repetition coupled with the innovators that can be changed with simple repetition can bring along the rest of the organization. You can communicate and overcommunicate clarity, however, these require that there be continuous effort on the part of the organization to keep communicating the message. A better approach is to systematize some of the reinforcement of the communication so that it becomes woven into the fabric of the organization and requires less effort. That isn’t to say that you should stop communicating. Rather, Lencioni is saying that you should weave the communications into the fabric of the organization – and continue to periodically communicate clearly to the organization. Perhaps the most common – and least effective way of systematizing clarity is creating a corporate mission statement. Lencioni laments that in the 1980s organizations were sold the idea of creating a corporate mission statement and how hollow that mission statement was. It was so lofty and disconnected from the organizations’ real operating practice that it was a laughable exercise. Most mission statements despite their flowery words and generally positive positioning, are interchangeable with other corporation mission statements. In my talks I speak of platitudes – dull, flat trite remarks especially one uttered as if it were fresh or profound – I use the corporate mission statement as the penultimate example of a platitude. So on the one hand, the recommendation is to systematize the continued communication of corporate values, on the other hand they cannot be encapsulated in a way that is seen as fake. Even in the best organization, there are times when an organization will need new people to take up the corporate banner. This need not be due to people leaving for other organizations. Spouse’s jobs moving and retirements will still remove employees from the organization. On the positive side growth of the organization typically means hiring additional people. Thus the best long-term game for all organizations is to create a set of hiring practices that emphasize finding folks who share the worldview of the organization – who are ready and able to become committed to the values that the organization holds dear. It’s all too easy to have hiring practices which are neither effective at screening for talent nor effective at screening for attitude. Lencioni discusses hiring practices – which I’ve seen myself – which are more like dating than they are like an organized process for identifying good candidates. Instead of focusing on the core beliefs and skills that the person will need to know, interviewers sit across the table from someone and talk to them about their background. Developing a set of hiring practices that are designed to effectively filter people into those who can help the organization move forward both financially and on its values is a critical way that organizations can systematize the kind of organization that they want to be. Refinement is my own addition – not something you’ll find in the book. It’s been my observation that continual tinkering with the message — while keeping it stable at the core – is an effective way to continue to keep the message alive. The process of creating the values isn’t a one-shot thing. Instead it becomes a part of the culture to continually evaluate and reevaluate who the organization is. This in and of itself forces a consistent focus on what the organization is – and isn’t about. 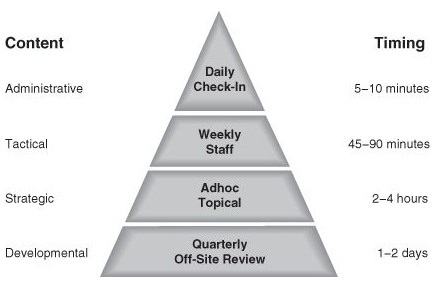 This is a way of converting what all too often becomes a one-time or periodic activity and converts it into a “way of proceeding.” Instead of big course corrections every few years everyone is all the time learning about what the values of the organization are – and what must be done to stay in alignment to those values. Perhaps it’s because one of Lencioni’s previous books was titled Death by Meeting or perhaps it’s just because most organizations are victims of how well, or poorly their meetings are run that he includes a section at the end of The Advantage on meetings. Having been involved with so many organizations over the years, I’ve seen a great number of styles of meeting. And despite some truly spectacularly run meetings, the par is – well – uninspiring. Even in good organizations the results of meetings are not very good. Lencioni offers a few clues as to why meetings are run so poorly. Most of the time spent in meetings feels as if it’s a person lobbying for their position. They want to make their approach known. As was mentioned above in the mastering conflict section, people sometimes spend their time preparing their next argument, instead of listening to the other folks in the room. However, healthy meetings are filled with people inquiring as to what the others in the meeting mean. They seek to fully understand what others are saying with inquiry. Not just the hollow and simple questions but ones that seek to fully understand the position of the other person. Learning reflective listening by restating what you heard the person say in your own words is an excellent first step leading to inquiry. Once you’ve reflected back what someone has said, you can ask if your assessment of the meaning is correct. In other words, the questions ask what does the impact of the idea look like. Too often meetings are filled with advocacy and snoring. Another quick meeting tip is to actively engage every member in the room. By having different kinds of meetings with different lengths and frequencies you can maximize effectiveness of the meeting time – if you have a strong leader to keep the meetings on track. 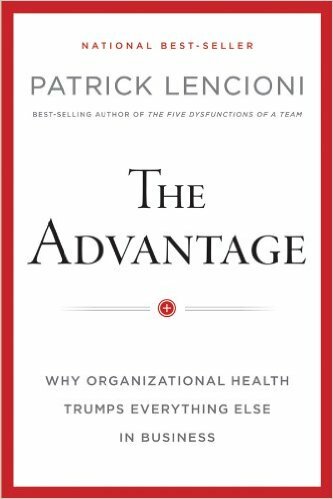 One of the things that struck me while reading The Advantage is how focused it is on large organizations. The problems described in the book are largely not problems that smaller companies have. In Lencioni’s defense, these are the kinds of clients he deals with – larger organizations who struggle with large issues of alignment, trust, and organizational health. I bring this up because if you’re running a small organization – or even a mid-sized organization – you may find that some of the advice here isn’t completely applicable to your situation. While the ability to identify unhealthy behaviors, to run better meetings, and systematize your operations are things that organizations of any size should consider, much of the content is targeted for larger organizations – which from my experience are much less healthy than their smaller counterparts. My caution is that if you’re in a small organization without a hint of politics, you may find that this book is aimed for a different audience. At the start of this book review, I mentioned that it felt like there were still places in the book which were “and then the magic happens.” One of the areas, for me, that I felt like was sorely missed was the process of converting the vision and strategy into meaningful tactics. Having worked with organizations on alignment of actions to the strategy and vision, I can say that there’s an art to converting strategies into a set of interlocking tactics that lead to the strategy and that many times managers don’t have the right kind of mindset nor the level of clarity needed to get to the right tactics. I’d love to see more about how others approach the strategy to tactics conversion. A practical framework for building a healthy organization is hard to come by so The Advantage wins with its framework for creating a healthier organization. Pick it up and get better alignment in your organization.